To all the fans of Rurouni Kenshin and Lupin III in LA, worry not! LA Eiga Fest will bring you these live-action film adaptations together with other Japanese movies from September 12-14 at the Egyptian Theatre. 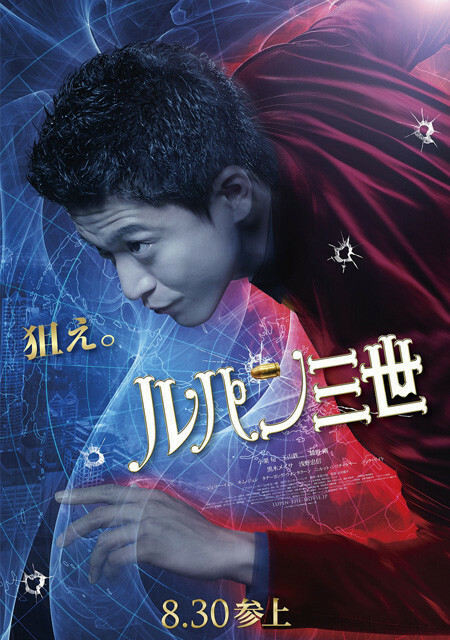 The festival will kick off with the screening of Lupin III, starring Shun Oguri, on Friday, September 12. The movie, which is directed by Ryuhei Kitamura, premiered in Japan on August 30. Another critically-acclaimed live action film, Rurouni Kenshin: Kyoto Inferno, which is directed by Keishi Ōtomo, will have its U.S premiere on September 14. The second installment of the widely-popular film stars Takeru Satoh, Takei Emi, Aoki Munetaka and Tatsuya Fujiwara. Other Japanese films will be shown throughout the three-day festival. To know more about the schedule and events, kindly visit their website here. Posted in Movie and tagged animated films, Aoki Munetaka, Arsene Lupin III, Battousai, Daisuke Jigen, Fujiko Mine, Goemon Ishikawa, Gō Ayano, Himura Battousai, Himura Kenshin, Jerry Yan, Kamiya Kaoru, Keishi Otomo, Koichi Zenigata, live-action film adaptation, Lupin III, movie, Rurouni Kenshin, Rurouni Kenshin: Kyoto Inferno, Samurai X, Sanosuke Sagara, Shun Oguri, Takei Emi, Takeru Satoh, Uzumaki Naruto. Bookmark the permalink. 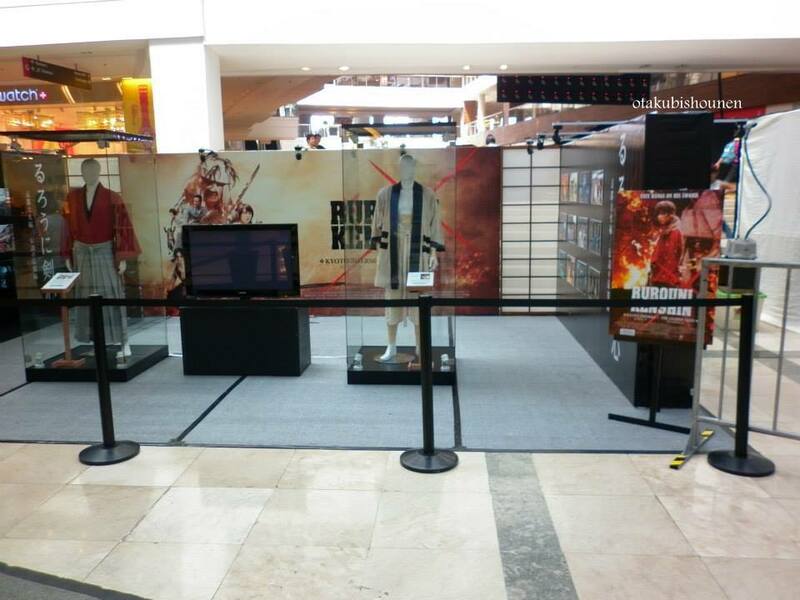 To all the fans of Rurouni Kenshin in Singapore, the day that you have all been waiting for is about to come! The much-awaited sequel of the live movie adaptation of Nobuhiro Watsuki’s manga is going to be shown in Singapore on the 28th of August. You may check Warner Bros. Singapore to get more updates and details regarding the tickets and schedules of the screening. 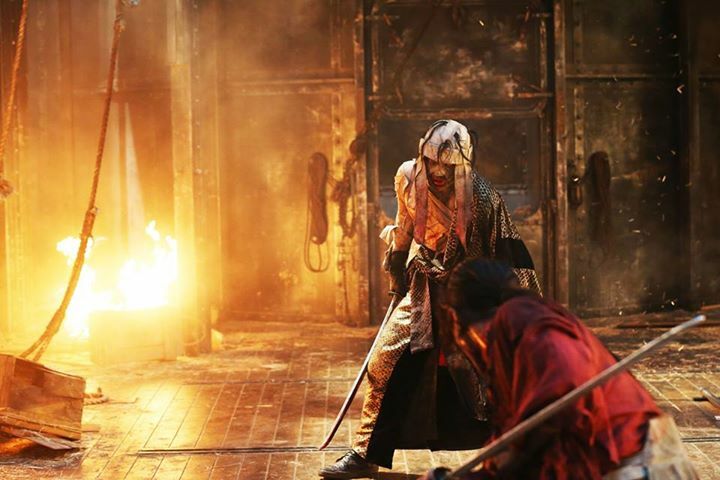 Don’t forget to catch the awesomeness of Rurouni Kenshin: Kyoto Inferno in your favorite cinemas tomorrow! 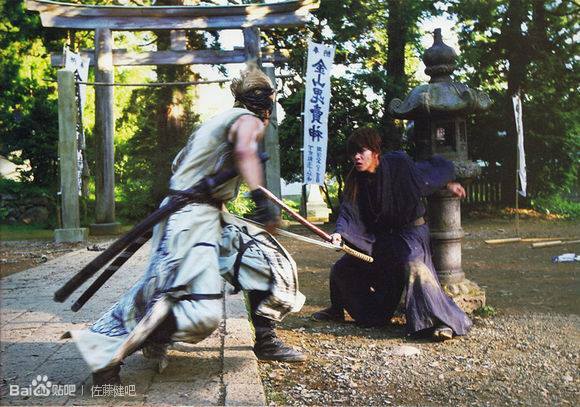 Posted in Movie and tagged Battousai, Himura Battousai, Himura Kenshin, Kamiya Kaoru, Keishi Otomo, live-action film adaptation, movie, Rurouni Kenshin: Kyoto Inferno, Samurai X, Sanosuke Sagara, Singapore. Bookmark the permalink. The moment that I had been waiting for has finally come. I got up at 5:30 am and traveled all the way from Las Piñas to Makati City where the presscon will be held. It took me two hours to get to Glorietta and when the mall finally opened at 10, I immediately looked for the Activity Center while my friend waited in line to buy a movie ticket to get a pass for the event. I went to the left side of the venue close to the stage and I just watched the dancers rehearsed for the program. The authentic costumes used in the film were also displayed next to the stage together with some posters and photos taken during the filming. However, a few minutes after that, the guards requested the fans to leave the area since they were still in the process of organizing the place. Therefore, I ended up positioning myself at the center, right in front of the stage though it was a bit farther than my first station. I also managed to be friends with the other fans around me (who, by the way, are also members of Rurouni Kenshin Pinas, an RK group on Facebook). The costumes and photos were displayed next to the stage. Let me just rant a bit. The guards who were dispatched in my area were really upsetting. As early as 1:30 pm, we already asked them if we wouldn’t be driven away later when the program starts. AND THEY TOLD US THAT WE WERE ALLOWED TO REMAIN IN OUR POSTS FOR THE EVENT. And much to our dismay and annoyance, later that day, at around 3 or 4 o’clock, they started shooing us away. To make my rant short, we ended up arguing with the guards and we really fought for our right to remain in our position. LOL. They were so disorganized and unsystematic. Before 6 o’clock struck, some performers signaled the beginning of the event with a dance performance infused with traditional Japanese martial arts/swordsmanship. The same cosplayers who graced the red carpet yesterday at Megamall also went on stage. The host of the show, Ms. Sam Oh, stirred the crowd as the screen showed the arrival of Takeru Satoh, Aoki Munetaka and director Keishi Otomo. An estimate of 6,000 fans roared in excitement as Sam Oh called the guests one by one to come up on stage. And believe me, Takeru Satoh looks much more handsome in person than on TV. I couldn’t actually take a clear shot of them since my friends were so agitated they kept on bumping me. (Hence the blurry pictures). They first greeted the crowd before the press started asking questions about the movie and the stars. Aoki was just like Sanosuke in real life. He was so exuberant and his antics made him the crowd’s favorite. 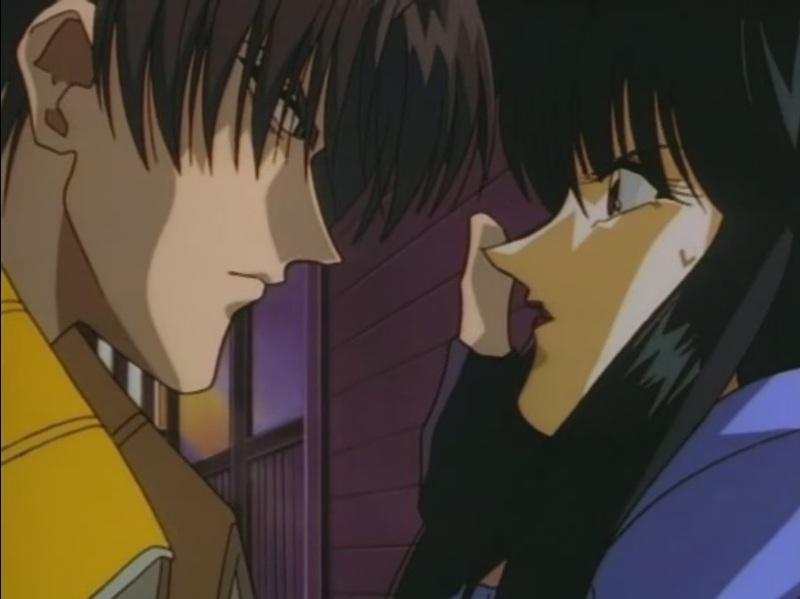 Both he and Takeru displayed their knowledge of a few Tagalog words such as “Magandang gabi”, “Maraming salamat” and our all-time favorite expression, “Mahal ko kayo”. I also give Aoki-san an A+ for his efforts to answer all the questions in English. He pumped his fists in the air as he encouraged the fans to chant “Sano! Sano!”. Takeru, on the other hand, stood afterwards and sent a flying kiss to the crowd, making us squeal in delight. When asked whether they sustained some injuries during the filming, Aoki, who played the character of Kenshin’s best friend, Sanosuke, said that he lost a tooth. “But I don’t mind, because I’m Sanosuke!“, he added to reassure the fans. Takeru, however, said that he suffered from several injuries that he cannot point out one in particular. He was also asked if he knows someone who is similar to Himura Kenshin in real life, and he said he doesn’t know one. And Aoki, being the animated guy he was, raised his hand and answered, “I know, I know!” and pointed to Takeru, “…him”. Another person from the press asked the trio about their opinion if the Hollywood decides to do an American remake of Rurouni Kenshin, and obviously, we rebuffed in unison. 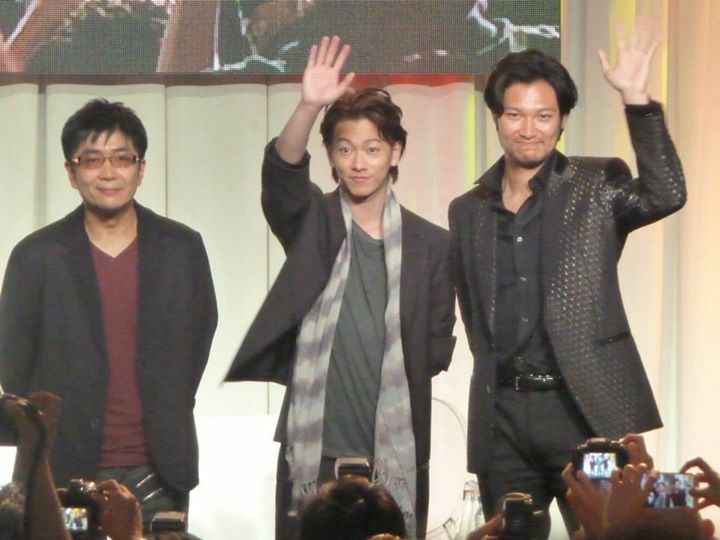 Takeru exclaimed that his response is probably similar to that of the fans’, while director Otomo dared and challenged the Hollywood to take their chance. Aoki also surprised the fans when he described himself as “ASTIG”, which he learned from his Filipino friend. I would say that Aoki totally hyped and owned the stage that night. The press conference lasted for about an hour, but the experience I had during this event will last forever. I didn’t expect that this day would happen when I could already see and hear Takeru Satoh LIVE. He is one of my favorite Japanese artists, and Aoki Munetaka has now been included in my bias list. It’s too unfortunate that I couldn’t catch a glimpse of Takei Emi’s beauty, but other fans around me confirmed how simple yet elegant she was during the red carpet event. Until now, I still have some regrets since I couldn’t make it last August 6, especially when many fan accounts testify that the Wednesday event was way better than the presscon (in terms of interaction with the artists). Many people got their autographs and others even shook hands with Emi, Takeru, Aoki and director-san. I thought I wouldn’t be able to see them in Megamall because I didn’t win any tickets/invites from Warner Bros PH and SM Cinema. (I guess I’m not just really lucky when it comes to raffle draw and promos) *weeps miserably* So I ended up filing a leave of absence from my company on Thursday. Turns out that the red carpet premiere was more fun than the presscon. Fans around me even dubbed Glorietta as “Ayala Inferno”, due to the guards’ exaggerated stringency and disorganized system. 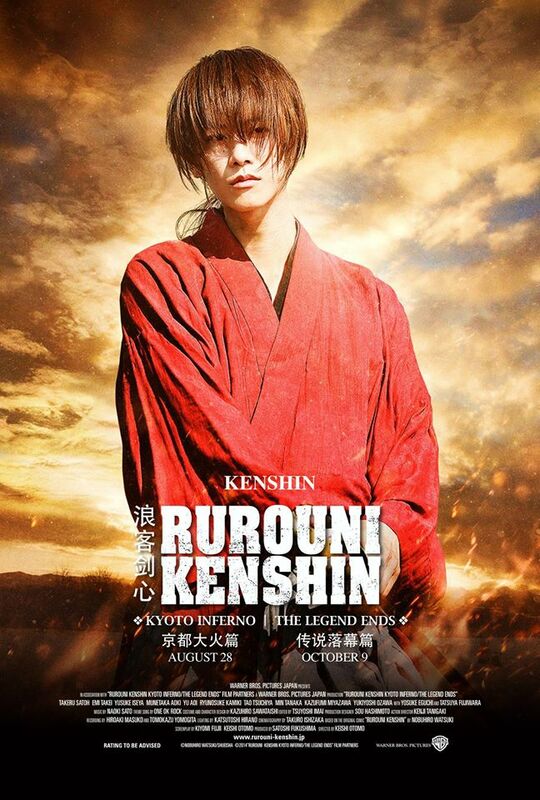 Rurouni Kenshin: Kyoto Inferno will be shown in the Philippines on August 20, and the third film will be screened on the 24th of September. Let’s all watch these movies and make them a blockbuster hit! 頑張ってください! 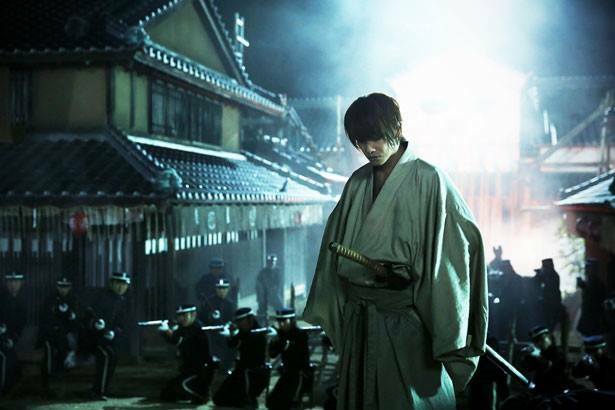 Posted in Uncategorized and tagged Aoki Munetaka, Himura Kenshin, Keishi Otomo, press conference, Rurouni Kenshin, Rurouni Kenshin: Kyoto Inferno, Rurouni Kenshin: The Legend Ends, Sanosuke Sagara, Takei Emi, Takeru Satoh. Bookmark the permalink. 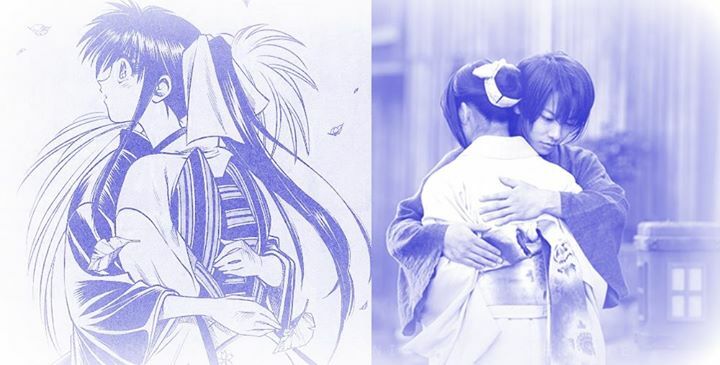 Fans of the popular anime/manga of the 90s called Rurouni Kenshin (also known as Samurai X) were delighted upon the news of the sequel of the live-action film adaptation of the said anime. The first movie was released in 2012 and it garnered rave reviews from both critics and fans. Much to the delight of everyone, a two-part sequel was confirmed to take place. 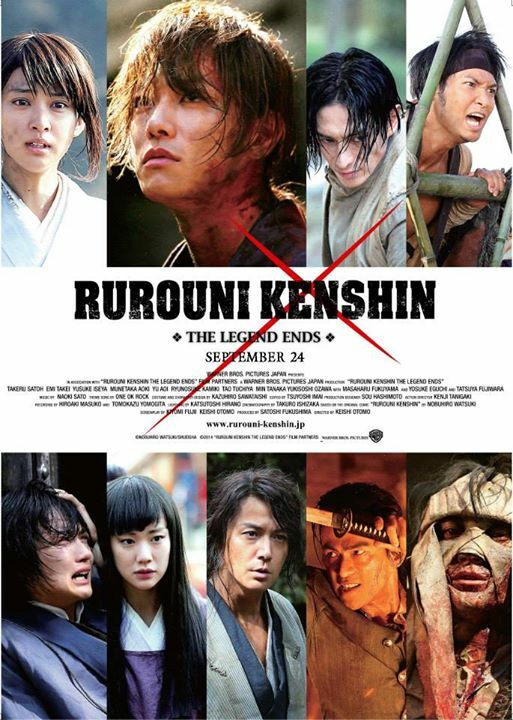 The second movie, named “Rurouni Kenshin: Kyoto Inferno” was released in Japan on August 1, 2014, while the third part will be shown on September 13 and is entitled “Rurouni Kenshin: The Legend Ends”. The Asian premiere of Kyoto Inferno was held in the Philippines on August 6, Wednesday at SM Megamall in Mandaluyong City. The red carpet event began at around 6 pm. The Filipino cosplayers first walked the runway as thousands of fans cheered loudly when the stars of the film showed up at the venue. 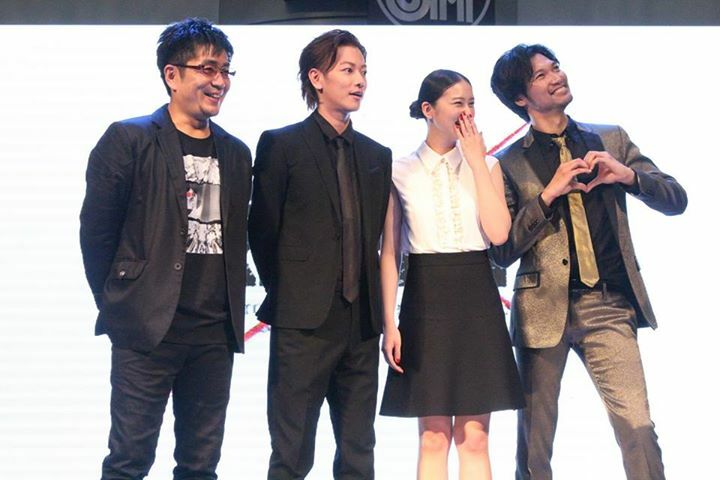 Takeru Satoh, Aoki Munetaka and Emi Takei who reprised their roles as Himura Kenshin, Sagara Sanosuke and Kamiya Kaoru respectively, walked the red carpet with their director, Keishi Otomo. Unexpectedly, the guests took their time to sign autographs for the fans who gathered to see their favorite stars. They greeted the crowd in Tagalog as they were welcomed with a loud cheer and applause from the audience. They also answered a few questions on stage before the advanced screening started. 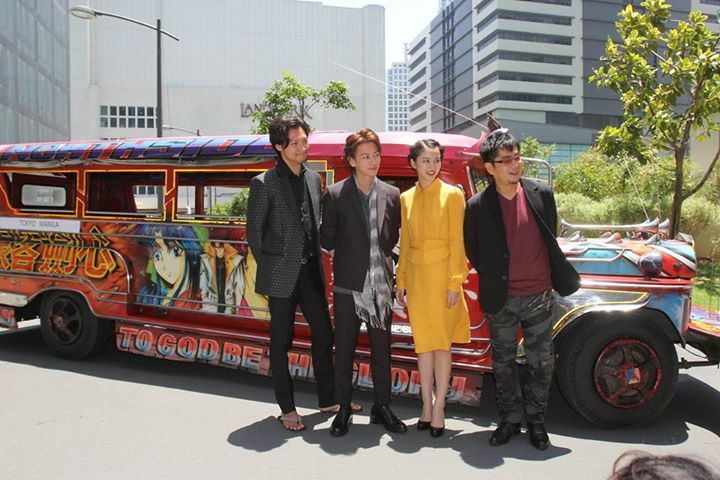 The following day, the four of them were also appointed as “Cultural Friendship Ambassadors” to the Philippines wherein they were presented with the jeepney decorated with a Rurouni Kenshin art. 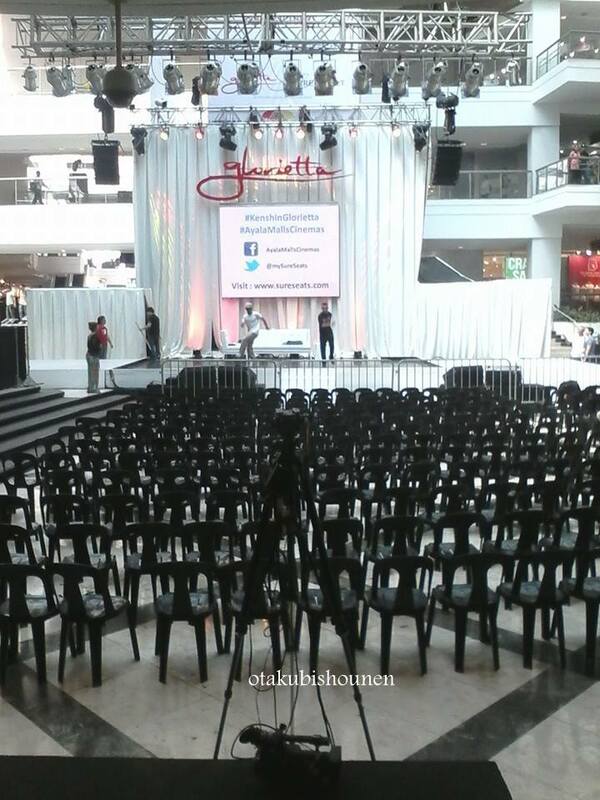 Afterwards, they headed to a press conference event held in Glorietta Activity Center in Makati City. Takei Emi, however, couldn’t make it to the event since she had to leave the country in the afternoon due to other schedules. To read my personal account of the press conference event, click here. 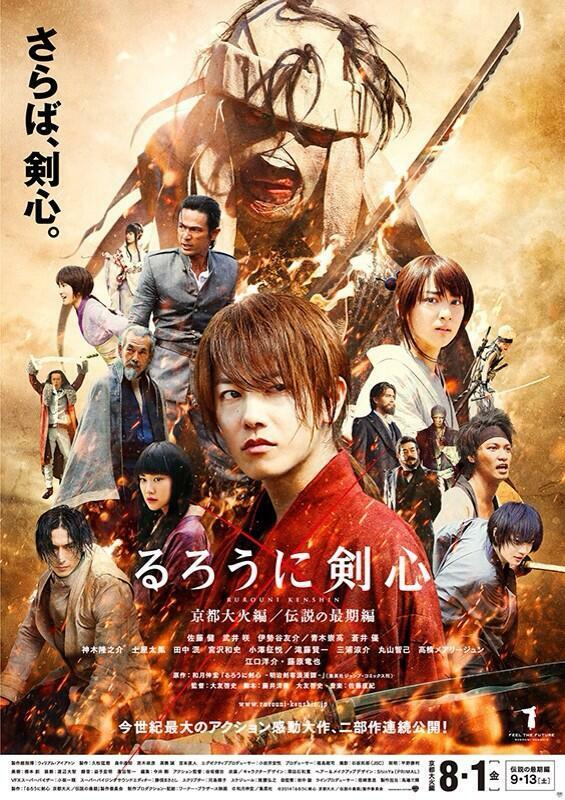 Posted in Uncategorized and tagged Aoki Munetaka, Asian Premiere, Himura Kenshin, Kamiya Kaoru, Keishi Otomo, Rurouni Kenshin, Rurouni Kenshin: Kyoto Inferno, Samurai X, Sanosuke Sagara, Takei Emi, Takeru Sato. Bookmark the permalink.